Rev. Jeff Hendrix was born to James and Jacalyn Hendrix on February 20, 1988 and was baptized into the Christian faith on the same day. He never wanted to be a pastor. He grew up in St. Joseph, MI. His home church was Grace Lutheran Church, St. Joseph (WELS) where he immersed himself in the audio/video program for church, doing graphic design for church and directing the video recordings of each church service. It was in doing this that Jeff became interested in video production and design, which led him to Bethany Lutheran College for communication. While he was there he began to appreciate historic Lutheran doctrine and practice, recognizing the beauty and teaching in the design of the divine service. Professors at Bethany encouraged him to consider studying for the pastoral office. He listened to their advice. An untimely switch in the biblical languages schedule at Bethany took him to Martin Luther College in New Ulm, MN for Hebrew. But he met his wife Carla Carmichael while taking classes there, so it worked out rather well. She received a triple major from MLC in elementary education, secondary instrumental music, and secondary choral music and was called to be the 3rd grade teacher of Mt. Olive Lutheran School in Mankato soon after. After graduating from Bethany College, Jeff continued his communication training and earned a Master’s Degree in Telecommunications from Ball State University. Afterwards he finally began seminary at Bethany Lutheran Theological Seminary. Seminary began to teach him the beautiful design of all of God’s teachings, but also made him aware of just how much more there is to know. Prior to accepting the call to Faith, Rev. 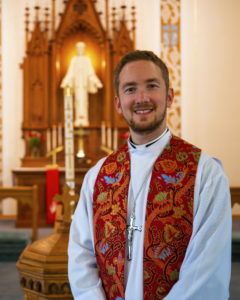 Hendrix has served Good Shepherd Lutheran Church in Indianola, IA during a vacancy as a vicar and as as pastor of the dual parish of Calvary and Grace Lutheran Churches in Ulen and Crookston, MN. Rev. Jeff and Carla Hendrix were married in August of 2014. The two have one child, Koren, who was born January, 2018. They are excited to have the opportunity to live and serve in Oregon, WI.